So what if the history of “fresh hop” beers might be 1,200 years old or only 20? So what if the science behind what makes the aroma and flavors of “fresh hop” beers different is not at all clear? So what if we have to put the term “fresh hop” in quotation marks because it’s not exactly clear what that means? Because what could be more wholesome than a beer made with fresh farm hops? Any silliness aside, there’s a whole lot not known about brewing with hops directly off the bine, but brewers love making these beers and so far have found plenty of customers. Who may or may not care about the answers to three basic questions. It sure seems possible that back in the first millenium a monk stepped into a monastery hop yard, picked some hops and tossed them into a batch of beer. However, there’s simply no record of brewers using freshly picked hops in brewing until Wadworth & Company in England brewed Malt & Hops in 1992. Brewmaster Steve Dresler credits Washington hop merchant Gerard Lemmens, a native of England, with telling him about that beer. Sierra Nevada brewed what’s thought to be the first American “fresh hop” beer in 1996. 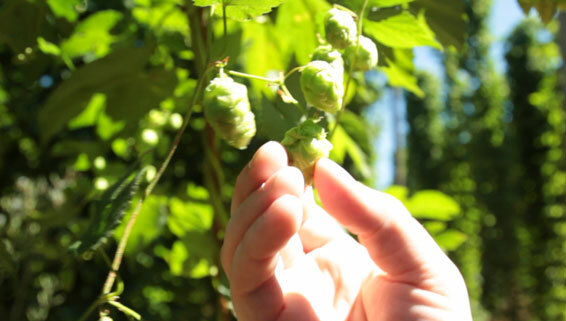 Today hundreds of breweries make beers with freshly picked hops, either shipped directly from the Northwest or purchased from a growing number of small, local farms. One measure of their popularity is the “Green Hop” package hop broker Hop Union offers. The company shipped 6,200 pounds of hops overnight in 2008, compared to 30,000 pounds this year. Why are they worth the trouble? 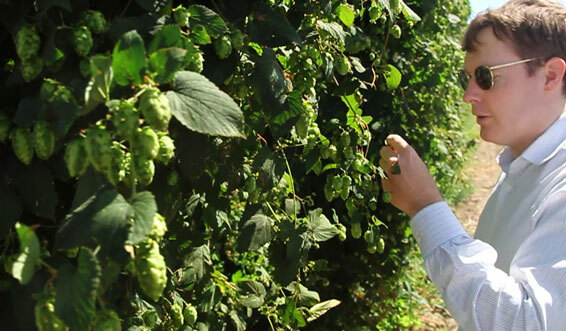 Sixpoint’s Shane C. Welch inspecting hops fresh off the bine. A year after Sierra Nevada brewed the beer it now calls Northern Hemisphire Harvest Ale for the first time, the late Bert Grant made his own Fresh Hop Ale, using only Cascade hops, at his Washington brewery. Drinking it on tap in his pub Grant talked about what he expected from the beer. “You should feel it in the back of your throat,” he said. Not taste it but feel it. That’s more than hop bitterness talking. That’s freshness. Stan Hieronymus is the author of For the Love of Hops. Read more from Stan on his blog at appellationbeer.com.